The primaries were held in Wisconsin tonight and there were 5 Democratic candidates competing to earn the right to take on current Governor Scott Walker in the 05-JUN-12 Recall election. The stakes for the Leftists were high and you couldn’t have imagined a more motivating state primary in the US than this one so you’d expect a high voter turnout on the Left while turnout for Walker’s primary (which was basically uncontested) should have been much less. Here are the results as of 11:20 pm EDT from the Journal Sentinel Online. If you do the math you see that Walker has almost the same number of votes as all 5 of the Democratic primary candidates COMBINED! All 5 Democratic candidates got 585,888 votes while Walker got 571,573 votes (with 92% reporting). Even if all the Leftists who voted in this highly popular primary throw their support to Tom Barrett, it stands to reason that a motivated Republican block will easily propel Governor Walker to victory in the Recall election. But the Moonbats from Wisconsin Union are still clueless as to the eventual failure of their massive recall effort as is displayed in a few tweets from their faithful. Recall hasn’t been successful yet – Walker is still the Governor! You still have to face Walker in June! Does this mean Union Thugs will increase their violence and intimidation tactics? 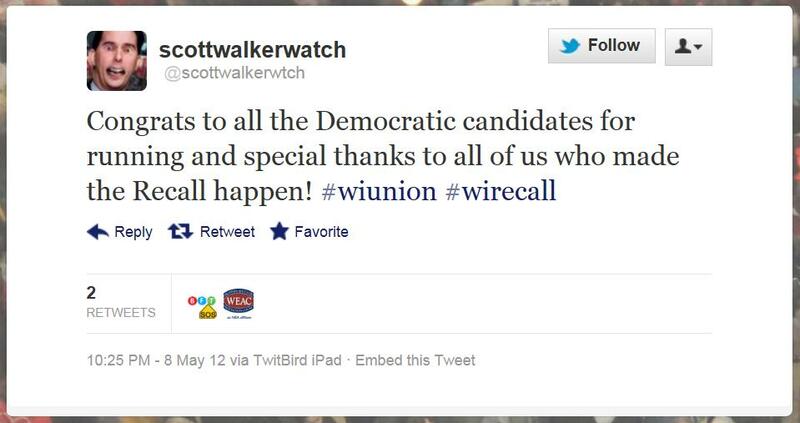 Gee, I wonder how many Republicans stayed home knowing that Walker was going to win his primary easily? The failure of Falk to win the Democratic nomination is devastating to the public sector unions since they were the ones who started this recall effort and these same Union bosses threw their full support behind Falk. The failure is compounded when you consider all the national Union and Leftist dollars that were wasted in last year’s Wisconsin Senate recall failure and is apparently going to be wasted in this year’s governor recall failures. The tears of the Leftists, not only in Wisconsin but all over the country, will taste so sweet in June when their failure is made complete.